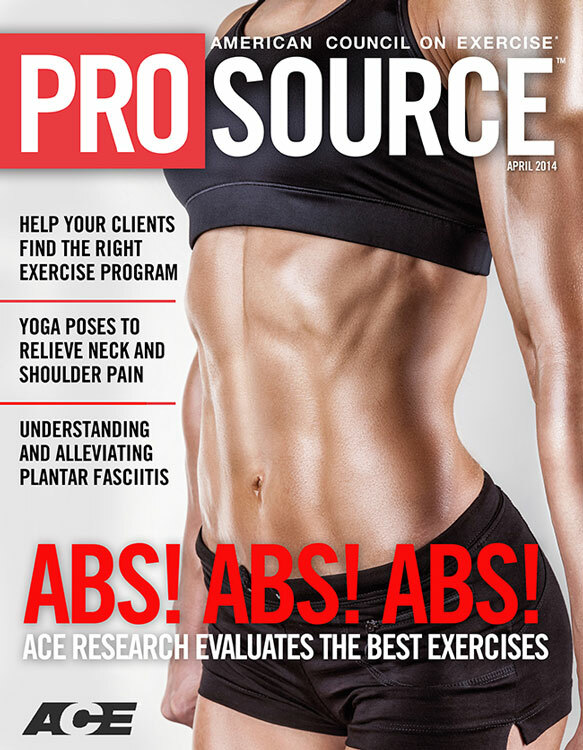 ACE - ProSource™: April 2014 - Abs! Abs! Abs! by Edward Stenger, M.S., John P. Porcari, Ph.D., Clayton Camic, Ph.D., Attila Kovacs, Ph.D., and Carl Foster, Ph.D.
Roundtable Discussion: What is the Role of the Qualified Fitness Professional in the Healthcare Continuum? Tight, well-sculpted abs are used ad nauseam to sell countless products and services around the world. And given that both men and women seem keen on getting tighter abs (or at least looking at them), they probably account for more selling power than just about any other body part. If this all sounds familiar, it should. Promises like these flood the airwaves and webpages, yet most Americans possess something more akin to a one-pack or even a keg. Still, legions of hopeful consumers spend millions annually on exercise machines and products in search of a quick-fix path. But the real question is: Are any of those exercises and machines more effective than the good ol’ crunch? Obviously, strong abs are about much more than simply good looks. They are key to increasing core strength and endurance, improving posture, reducing low-back pain and enhancing sport performance. 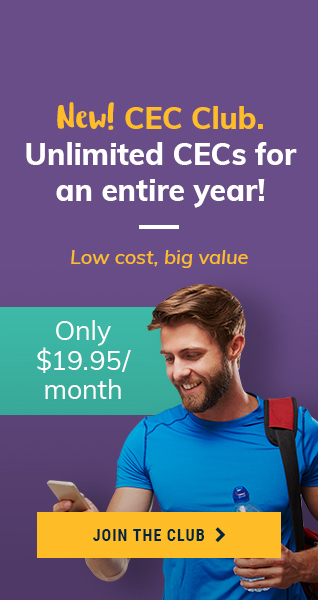 In keeping with its role as America’s Workout Watchdog®, the American Council on Exercise (ACE) commissioned exclusive research to determine just how effective some of the most popular devices and ab exercises are in comparison to the traditional crunch. ACE enlisted the help of the experts at the University of Wisconsin—LaCrosse and its Clinical Exercise Physiology program. Led by John Porcari, Ph.D., and Edward Stenger, M.S., the research team first recruited 16 healthy volunteers (eight men and eight women) between the ages of 18 and 24. To determine which exercises are the most beneficial for activating the abdominal musculature, researchers chose popular equipment including the Ab Circle Pro, Ab Roller, Ab Lounge, Perfect Sit-Up, Ab Coaster, Ab Rocket, Ab Wheel and Ab Straps, as well as ab exercises including the yoga boat pose, stability ball crunch, decline bench curl-up, captain’s chair crunch, bicycle crunch, side plank and front plank. All participants attended one practice session in which they tried each of the devices and each of the exercises to help familiarize them with the study protocol and exercises they would be performing. On a subsequent day, researchers used electromyography (EMG) to identify a baseline of abdominal strength for each participant. As the individual lay on a decline bench, with the hands across the chest and a 90-degree angle at the torso and the hips, researchers grasped onto the subject’s shoulders and attempted to pull the subject downward on the bench while the subject resisted. Electrodes placed on the upper and lower rectus abdominis (URA and LRA), external obliques (EO) and the rectus femoris (RF) measured subjects’ maximum voluntary contraction (MVC) during this activity. Next, subjects were monitored while performing five repetitions of eight different abdominal exercises, with two minutes of rest between each exercise. On the following day, subjects again performed a MVC, along with five reps of the remaining seven abdominal exercises. At no point did the subjects report feeling fatigued between exercises or between days of testing. As they performed each exercise, subjects were prompted using a metronome set for three seconds per repetition (1.5 seconds for the eccentric phase and 1.5 seconds for the concentric phase). Five reps were recorded for each exercise. The middle three repetitions were used for analysis. For the front plank, side plank and yoga boat pose, the middle nine seconds of data were recorded for analyzing. Immediately following both testing sessions, the researchers processed the data. In all, six men and eight women completed the study (results from two of the original 16 subjects were not used due to incomplete data). 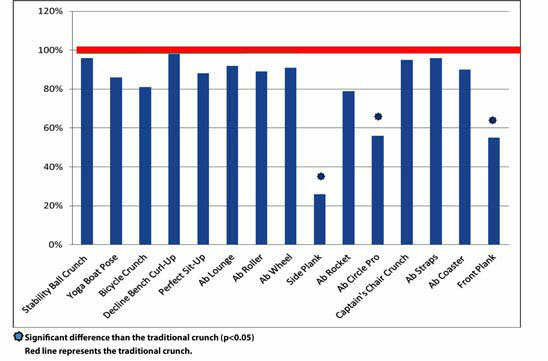 Researchers determined that none of the exercises elicited greater muscle activation than the traditional crunch. In fact, the Ab Wheel, Ab Circle Pro, side plank and front plank all had significantly lower muscle activation in the URA compared to the traditional crunch (Figure 1). For the LRA, the Ab Circle Pro, side plank and front plank all had significantly lower muscle activation than the traditional crunch (Figure 2). The manufacturer of the Ab Circle Pro was recently fined by the Federal Trade Commission for false advertising (lose up to 10 pounds in just two weeks), awarding defendants between $15 million and $25 million. Figure 1. Comparison of upper rectus abdominis (URA) activation for the various exercises compared to the traditional crunch. Figure 2. 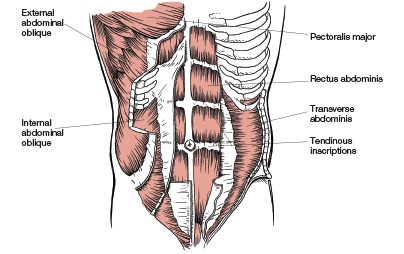 Comparison of lower rectus abdominis (LRA) activation for the various exercises compared to the traditional crunch. 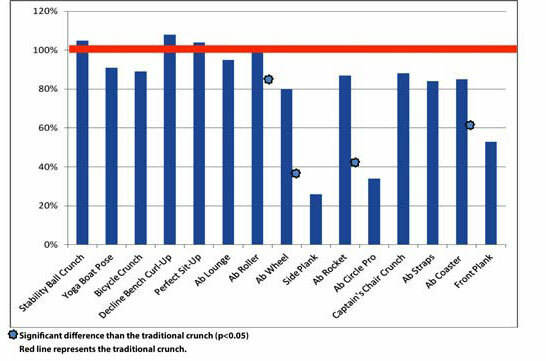 The mean EMG of the URA and LRA for the traditional crunch was a combined 68.4% of MVC. Because all of the other exercises and machines were compared to this exercise (which elicited a relatively high MVC), the possibility of any given exercise eliciting a stronger response was less than if, for instance, the traditional crunch elicited just 40% of MVC. The EMG activity for each exercise was normalized to that of the traditional crunch—the baseline for comparison. 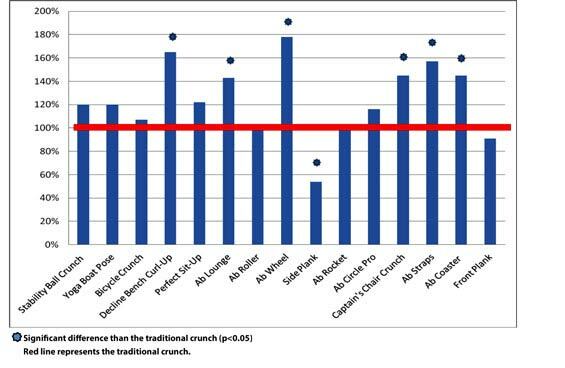 Because the level of EMG activity associated with the traditional crunch was reasonably high, this might partially explain why many of the other ab exercises didn't elicit significantly higher levels of muscle activation relative to the traditional crunch. As for the EO, there were six abdominal exercises that had significantly higher muscle activation than the traditional crunch: the decline bench curl-up, Ab Lounge, Ab Wheel, captain’s chair crunch, Ab Straps and the Ab Coaster (Figure 3). Researchers point out that the likely reason for this higher activation is because those machines are more free-moving and require the subject to maintain balance and control throughout the exercise, using the EO to stabilize the entire body. Figure 3. Comparison of external obliques (EO) activation for the various exercises compared to the traditional crunch. Similarly, the rectus femoris (RF) saw significantly higher muscle activation in nine exercises, including the yoga boat pose, bicycle crunch, decline bench curl-up, Perfect Sit-up, Ab Lounge, captain’s chair crunch, Ab Straps, Ab Coaster and front plank. While the isometric exercises required constant contraction of the RF to maintain balance, the other exercises required subjects to pull their legs toward the body to complete the exercise (or their feet were fixed), causing the RF to fire continuously as well as causing flexion at the hip and contraction of the RF. What do you think about the results of this study? Will it change how you approach abdominal training with your clients? Let us know your thoughts on this topic in the comments section below. Researchers determined that _________________ elicited greater muscle activation than the traditional crunch. This study confirms that _____________________________ the upper and lower abs. Which of the following exercises did NOT elicit significantly higher muscle activation in the rectus femoris (RF)?